Its been a brilliant 2017 Champing™ season and before we’d even packed up our last camp bed we were already thinking about expanding to new sites for 2018. But where to start? The Churches Conservation Trust (CCT) looks after 352 churches across England, so we’re not short of sites, but as a core team of three ChampBots (plus one dog), we knew that we’d have our work cut out for us! ChampBot Jake, helping us to sniff out the best sites. Is there ample room for camp beds? 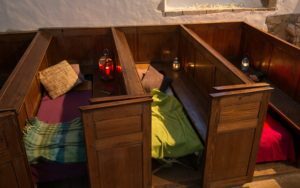 Are there any exceptional features in the church, eg box pews that can be used as beds? Are there activities in the local area, eg walking, cycling or even canoeing? Is there a suitable site for ChampLav? Are there nearby hostelries that could provide breakfast / dinner? 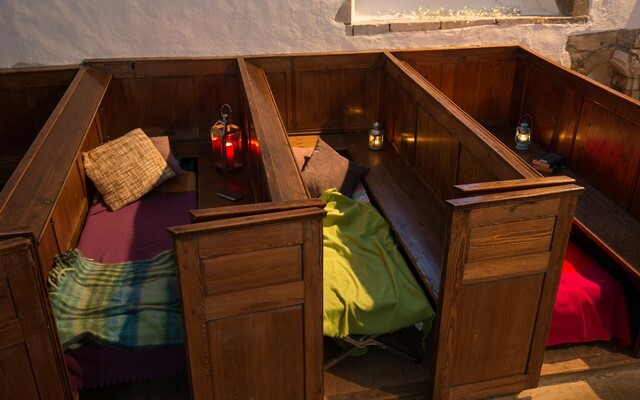 Cosy box pew beds at The Church of St Mary The Virgin, Fordwich, Kent. The next phase involved recces of the sites and lots of searching on Google Earth to get a good idea of the local area. An important element is also consulting with local volunteers at the church, residents, businesses and any other stakeholders. This was a lot trickier in the early days of Champing™ as it was just an idea, but now we have ‘created a thing’, we can demonstrate how popular Champing™ has become and also the wider benefits to CCT. Understandably there are still some questions such as ‘where will the beds be stored when not in use?’ ‘what if there are bats?’ and ‘how does the ChampLav actually work?’ I won’t go into this last question here, but believe me it’s revolutionary – you can read about it in more detail in another blog here. As marketing ChampBot, I’m currently visiting our confirmed 2018 sites with our Champ Photographer, Joseph Casey. Joe has done all of our Champ Photography and knows exactly what we’re about. 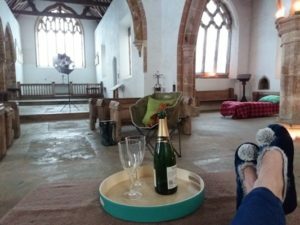 He even indulges me in my ideas for what I think would make a good snap, such as a close up of my feet in slippers (trying to create a feeling of hygge of course). My feet. They could become famous, you know. I’ve also recruited a new ChampBot called Jake. I’m currently dog-sitting Jake for my parents, so I thought he should earn his keep and do some modelling for us. We’re terribly dog friendly at Champ Towers so we were already looking for a doggy model to demonstrate the canine joys of Champing™. Jake was a bit nervous at first, but he soon settled into things and now revels in his new role. 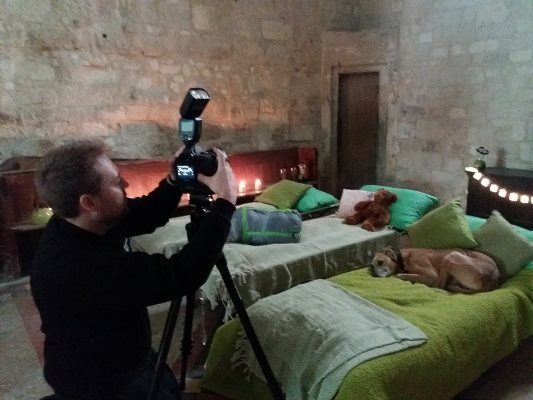 However he does need to stop wandering into the long exposure shots, the result of which is a ‘ghost dog’- sorry Joe. Jake earning his keep. Those dog biscuits aren’t going to pay for themselves. I’ve still got a few more sites to photograph, but I can’t tell you where they are yet – we’ll have a grand opening of bookings in the new year where all will be revealed and you’ll be able to book online. This weekend I’m going to be visiting some secret locations in the West Country. 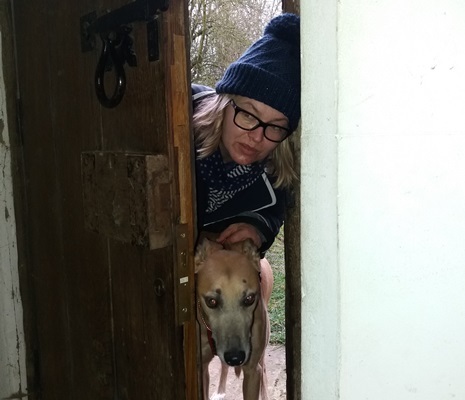 I’m taking my kids and Jake – what was that someone once said about working with children and animals…? I’ll let you know how I get on! By the way, you don’t need to wait for the big reveal to get in on the action. You can now buy Champing Vouchers online here. A perfect Christmas gift for the adventure-seeker in your life!